The RMT AGM took place in the wake of Jeremy Corbyn's tremendous general election result. 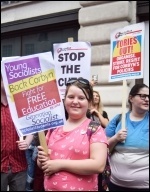 Tories' tuition fees wobble: fight for free education! Fight establishment's Grenfell insults: no to cover-up, safety for all! Every day seems to bring a new insult to the survivors of the Grenfell Tower fire. They are still seeking assurances of local rehousing. Their landlord has charged them rent for burnt-out homes in error. 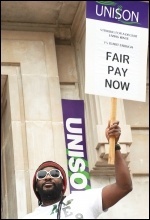 Public sector wages - Pay up! Over 100 local residents, including 20 who couldn't get in, packed the Berner Community Centre in Tower Hamlets, east London, on 2 July, angry about a number of recent attacks on local Muslim people. No compromise with Tories or Blairites. Fight for mandatory reselection. Organise and strike for Corbyn's anti-austerity policies. The 'gig economy' is bad for workers - but good for fat-cat bosses. Like austerity, it is akin to a blood transfusion system for money. The staff understand that the fightback can only come from us, and by taking the campaign out into the community. On 21 July, the greater Huddersfield and Calderdale Joint Health Scrutiny Committee (JHSC) referred the decision close the A&E department at Huddersfield Royal Infirmary and to downgrade the hospital to the health secretary Jeremy Hunt. On 4 July Birmingham South East Socialist Party branch discussed the new book From Militant to the Socialist Party by Peter Taaffe.